After a long day of traveling for a total of 9 hours by car & plane, my family finally arrived home. As I walked up the stairs, I noticed a package by the front door, and figured that it was just more parts for the computer that my brother is building [AKA the computer he is paying my cousin to build for him]. When I came downstairs later, though, Larry had taken the package to the kitchen and was asking my dad what it was. A bomb? I thought idly as I loaded laundry into the washing machine. Upon opening the package, we were faced with another box. “It’s upside down,” Larry said, observing the This Side Up arrows on the side. 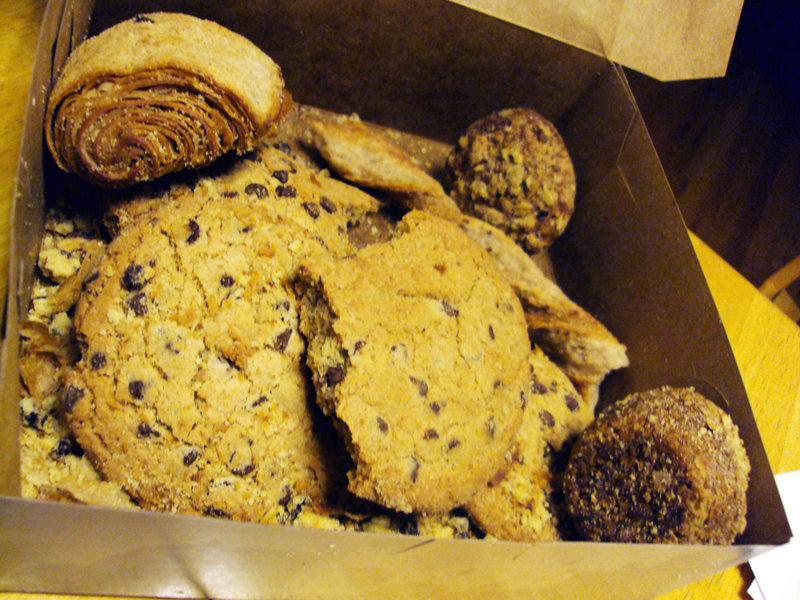 Dad flipped the box over and out dropped a flimsy cardboard box of…pastries. After I ravaged the contents. I suppose the “baking company” was a hint, but we couldn’t help but wonder who the hell would be sending us a box of cookies without any notification. They looked delicious, though, and I blocked out thoughts of poisonous baked goods as I reached for a chocolate chip cookie. On the lid of the inside box was a name, address and phone number. The intended recipient of these cookies turned out to be Yanling Yin from Downers Grove; my father’s name is Yanling Li. For food that was 6 days old, everything inside was surprisingly delicious. Mother ended up calling the phone number, but it was apparently the number to an office, and Yanling Yin was out of town until the 10th. I’m not exactly sure why this package ended up at our house, but I am enjoying the spoils nonetheless. You are currently reading This Made My Day at auradis.